After spending four years in a Siberian penal settlement, during which time he underwent a religious conversion, Dostoevsky developed a keen ability for deep character analysis. 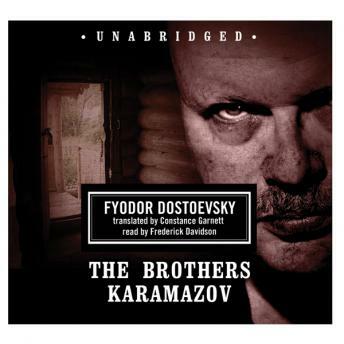 In The Brothers Karamazov, he explores human nature at its most loathsome and cruel but never flinches at what he finds.The Brothers Karamazov tells the stirring tale of four brothers: the pleasure-seeking, impatient Dmitri; the brilliant and morose Ivan; the gentle, loving, and honest Alyosha; and the illegitimate Smerdyakov: shy, silent, and cruel. The four unite in the murder of one of literature's most despicable characters-their father. This was Dostoevsky's final and best work. This book is a treasure. Unexpectedly fuuny and keenly insightful on human character. I just returned it, and already miss listening to it. Some of the characters are recognizable even today in 2018. The lawyers today are no different from those in the book. And Fyodor Pavlovich is a dead ringer for our current president. Amazing book. I've read it twice, but I can't stand the reader. Also, this recording skips two very important scenes with Grushenka. The first is when Alyosha meets Grushenka for the first time at Katerina Ivanovna's. That episode is important because Grushenka insults Katerina by allowing her hands to be kissed and not returning the compliment. The narrative refers back to that insult on many occasions. The second scene is when Rakitin takes Alyosha to Grushenka a second time after father Zosima's body began to decay prematurely and Alyosha's world is turned upside-down. In this part Grushenka sits on Alyosha's lap and tries to seduce him, but the innocence and purity of Alyosha's character overwhelms her. Love the story, cannot bring myself to finish listening though; the reader is unbearable! As one would expect with Dostoyevsky, the book includes a kitchen sink's worth of cynicism, wisdom, character development, and wit. There is always the buffoon Dostoyevsky character who puts his foot in his mouth at every opportunity, especially while drunk. Fyodor Karamazov, the dad, is a fool that keeps us laughing, as are some other characters, though to a lesser degree. I totally enjoyed this selection. This is a lengthy book, but one well worth the read. I appreciated Frederick Davidson as the reader and thought he kept a good pace and did a good job of distinguishing parts. The character development is the model for good writing. Although there is little "action" in the book, Dostoyesvsky retains the readers interest on the strength of his mixture of characters and surprising twists in the unfolding of their personality and nature. Alyosha summarizes the author's message, in my mind, with his statement in the final chapter: "Ah, children, ah, dear friends, do not be afraid of life! How good life is when you do something good and just!"